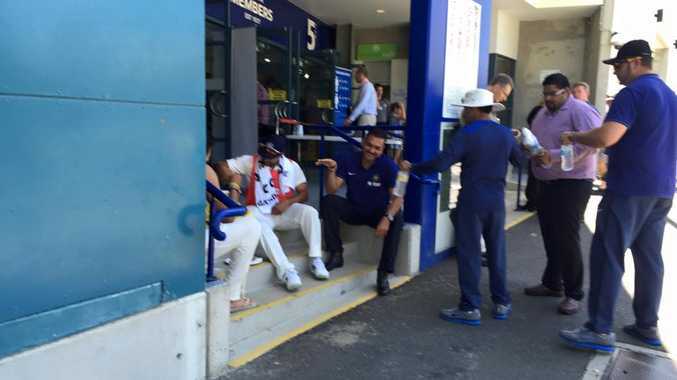 THE Indian cricket team has eaten a vegetarian lunch provided by Indian Mehfil restaurant on the Vulture St footpath after being dissatisfied with the food on offer inside the Gabba. The QT understands there was some dispute over the official lunch for the Indians on day three of the Second Test. A source told the QT that there "wasn't enough vegetarian food to go around" and the players insisted on eating the food from Indian Mehfil. "The team came outside and ate on the footpath outside gate five because the protocols are that you can't bring food in to the ground," a source told the QT. "There was a half hour of negotiations by the Indian team management and lots of people were watching it." The team is staying at the Sofitel Hotel and their meals are being catered for by Indian Mehfil restaurant that has outlets at Ipswich, Brisbane City and Upper Mt Gravatt. The Indian team has been eating at Indian Mehfil restaurants for the past nine years. The QT contacted Indian Mehfil owner Raj Sharma who was tight lipped about the incident but confirmed it took place. "All I can say is that my food is popular and that is why the team came outside the ground to eat it," he said.